I don’t know if anyone has noticed, but there is a new tagline for Tigers & Strawberries, right up there at the top of the page, under the title. It says, in somewhat sketchy grammar, “Cook local, eat global.” Obviously, it’s a take on the classic saying, “Think globally, act locally,” which I have always thought was a very sensible philosophy one could easily apply to the practicalities of daily life, but it’s been a bit inverted hasn’t it? It’s a rather odd thing to be a locavore who touts the delights of locally grown and produced foods and who also happens to be a chef who specializes in cooking foods from nations far removed from her Appalachian roots. Especially when these cuisines generally require ingredients, such as soy sauces, rice and coconut meat, which are quite simply not local to, nor are likely to become local to Appalachia any time soon. I mean, I know we have global warming, but I am not thinking that we are likely to start growing rice and coconut trees in Athens anytime soon. That meaning is this–I am not a hard-line, fundamentalist locavore. I never have been and never will be, and I don’t think it is necessary to be one in order to live a good and ethical life where you eat well, support your local economy and make the world a better place in which to live. I’m not a fundamentalist because I have found in my forty-five years on this planet, that is is nearly impossible to change the way humans do anything, much less eat, by getting all moral about it and telling them all the reasons its good for them to do it. It just doesn’t work. It’s proselytizing at its absolutely worst form which can turn into berating your audience into changing their point of view. It risks alienating people, boring them and infuriating them all the same time. And believe me, alienated, bored and infuriated people are not more likely to change anything about themselves–they are much more apt to dig in their heels and refuse to do anything but the exact opposite of what you are trying to get them to do, if for no other reason than to spite the clueless messenger who, with every good intention in the world, has tried to do a good thing and has made an absolute boor (and bore) of herself in the process. So, what does that phrase up there under my blog title mean? It means this–you -can- cook using primarily local ingredients–vegetables, fruits, meats, dairy products and if you are lucky, grain and legume staples–and still eat like a citizen of the world. By using local ingredients for the bulk of your diet, or even, frankly for half of your diet, and combining them with ingredients from elsewhere such as spices, sauces, condiments, some grains and exotic fruits and vegetables that simply will not grow in your climate, you are still making a difference in the world, and a delicious one at that. Especially when you seek out spices, grains, and condiments from elsewhere which are produced in fair-trade cooperatives which ensure that farmers from across the world are paid a fair price for their products which enables them to make a decent living for themselves and their families. Supporting not only local farmers, but farmers in Thailand or Peru or Mexico is thinking globally and acting locally on a grand scale, a scale that recognizes the common thread of humanity that ties each and every one of us in the world together. Besides–combining locally sourced ingredients with internationally sourced ones leads to creativity in the kitchen, which is always a good thing. For example–let’s take a look at Shagbark’s whole spelt berries. I happen to really like the flavor and texture of spelt berries, but I didn’t really know that about myself until I bought some of Shagbark’s and cooked them up to use as a replacement for the wild rice in my typical Thanksgiving day dressing which features many native American foods. Spelt isn’t native to the US in the same way that wild rice is, but it was grown right here in Athens county, instead of up in Minnesota, so I wanted to give it a shot and see what it was like. The flavor of spelt is deep, dark and rather rich. It’s chewier than wild rice, and has more character in every way, and it added a great deal of goodness to my dressing recipe. Spelt, which is a more ancient and some would say, “primitive”: form of wheat, also has more fiber than whole wheat, more protein than wheat, and is higher in B vitamins than wheat. It’s bloody well good for you, but even more importantly is that it tastes nutty and brown and autumnal and good. So, now that I know I like spelt, I resolved to come up with some other ways to use it. 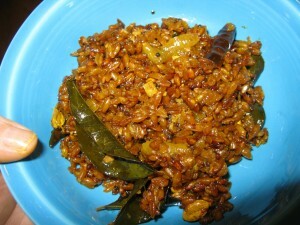 I decided to give it a shot in an Indian-style pillau, or pilaf, as it is called in the Mediterranean countries. 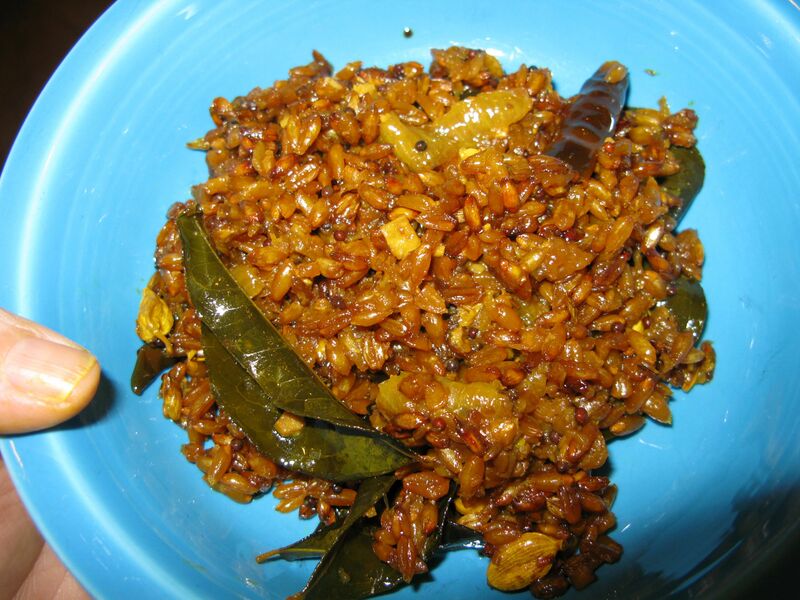 Rice is nearly always used in Indian pillaus, and usually in pilafs as well, but I wanted to see what would happen if I hauled off and cooked up spelt the same exact way I would rice. Don’t get me wrong, I adore rice and always will, but it isn’t exactly going to be growing in my backyard any time soon. Besides–the South Indian style spices I had in mind couldn’t help but taste divine with the deep, rich flavor of spelt berries. 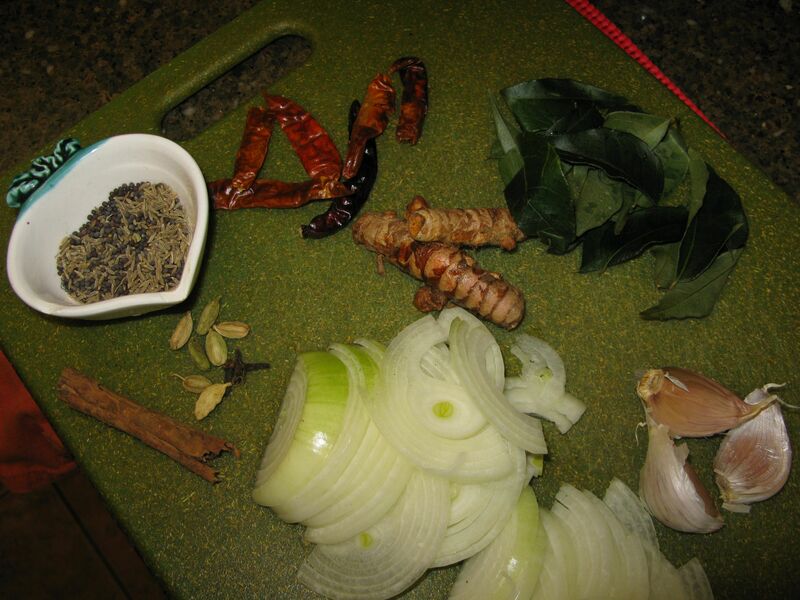 I planned on using onions, cinnamon, cardamom, cloves, mustard seed, cumin, dried chilies, fresh turmeric, fresh curry leaves, and garlic, all cooked together in ghee for a tarka. A tarka is a mixture of seasonings cooked in oil or ghee until they are browned and fragrant. 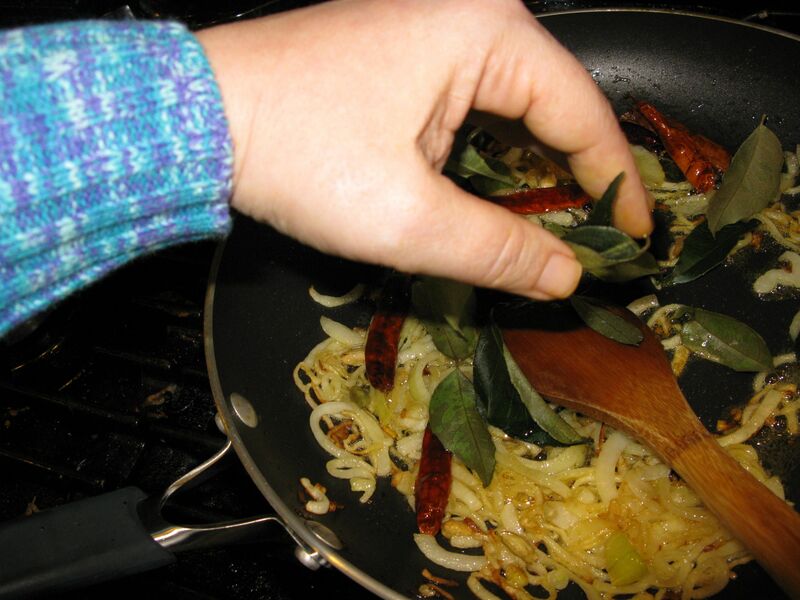 When it is finished cooking, the tarka is stirred into a pillau, dal or curry at the end of the dish’s cooking time, and the lid is clapped on to trap the fragrance of the spiced ghee, only to be removed just as the dish is served. As for cooking the spelt itself, it was simple–I just sauteed one cup of the berries in a tablespoon of ghee in a pot, added four cups of vegetable broth, about a teaspoon of freshly grated turmeric root, and salted it lightly, and brought everything to a boil. The lid went on the pot, the heat was turned down so that the spelt simmered, and I cooked it, stirring now and again for two hours–basically until the spelt berries were tender, but still chewy. All of the liquid is not absorbed with this cooking method, so before adding the tarka, the excess broth has to be drained off. I saved mine and put it into the freezer for use in a soup or stew later, as it not only has a lot of flavor in it, it has some of the water-soluble vitamins from the spelt that shouldn’t be wasted. So, how did it end up tasting? I thought it was delicious–nutty, spicy, fragrant, chewy and just plain old downright good. Paired with a bowl of masoor-moong dal with mushrooms and greens, it was highly nutritious Indian style meal made with primarily local ingredients that was soul-satisfying and VERY filling. And it was very warm, too, which is very important on these long cold winter nights. In a medium sized pot, saute the spelt berries in the one tablespoon of ghee or oil. After a minute or so, add the broth, turmeric and salt, bring to a boil, put a lid on the pot and then turn the heat down so the berries simmer, and cook, stirring now and again, for two hours, or until the spelt is tender, but still chewy. Melt the ghee in the bottom of a heavy-bottomed skillet. Add the onion slices and sprinkle well with the salt. Cook, stirring constantly, until the onions are a light golden color. Add the cinnamon, cardamom, cloves, and chilies, and cook, stirring until the onions are a deep golden color. At this point, add the mustard and cumin seeds, as well as the turmeric root, curry leaves and garlic, and cook, stirring until the onions are a deep reddish brown, the garlic is golden, the leaves are a deep green speckled with browned spots and the mustard seeds have sizzled and popped. Remove the tarka from the heat–it should be ready just as the spelt is done. Drain the spelt, and reserve the cooking liquid for a later use. Return the spelt to the pot it was cooked in, and pop it onto the fire again, and stir, cooking briefly to remove any excess liquid that is clinging to the grains. Then, scrape the tarka into the pot, stir it thoroughly into the spelt and put the lid tightly back on the pot, remove it from the heat and leave it closed until you serve it. Serve with a dal of some sort, and enjoy. I really try not to get preachy about the whole local/sustainable/grass-finished/pastured thing on my blog, for those very reasons – it’s just going to turn people off. I always let them know that while I may be eating grass-finished beef and vat-pasteurized, non-homogenized milk the grocery store versions are perfectly acceptable, and will give cooking directions for both/either, if the recipe calls for it. You make the spelt berries sound so good in this recipe, it makes me sad I no longer eat grains. You’re back! I’m so glad. You have been much missed.